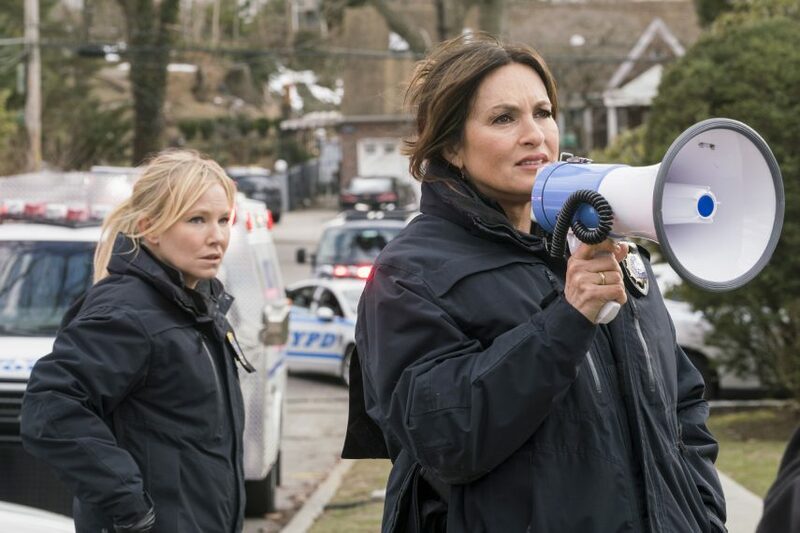 It's been a big week for Law & Order: SVU, as the NBC series was just renewed for a groundbreaking 20th season. This makes the crime show tied for the longest-running live-action drama series of all time. "I'm so excited," series star Kelli Giddish (Amanda Rollins) said of the good news to TV Insider at the 2018 NBC Upfronts on May 14. "It's going to be my eighth season playing Detective Amanda Rollins," Giddish continued. "I have such faith in the writers and the whole creative team that we have. It feels different this year. We're tied with Gunsmoke; we're tied with Law & Order. It's like lets dig our heels in and make this the best season ever." Someone on set who inspires the actress is SVU's leading lady and executive producer Mariska Hargitay, aka Lieutenant Olivia Benson. Giddish insists their friendship off-camera makes their on-screen moments that much more special. "[Our] personal relationship has evolved along with Olivia and Amanda's and nothing's forced," she said. "Our relationship is so strong in the show because it's so strong in real life and it feels great to know that she really has my back. We can now look at each other on the show and one look explains everything." Also, don't expect Season 20 to shy away from tough topics. The series is known for its "ripped from the headlines" storyline approach and Giddish acknowledges the sad truth that "there are too many [headlines] to choose from." So expect more family drama with a mix of politics and the affects of social media. Something that fans have also been wanting is a little more of Rollins' history. The character's family dynamic has been a plot point before and Giddish hopes to develop that more. 'Lost' alum Fionnula Flanagan and beloved 'Barney Miller' star Hal Linden will also stop by. "[The producers] try to incorporate it as much as possible but it's an hour episode and they have to show the crime, who did it, and tie it up. But I think that they do a really good job throughout the season of mixing it in."